Through their seed bank, Kevin Welch and Sarah McClellan work to preserve plants sacred to the Cherokee for future generations. This is the final in a series of four excerpts from The Color of Food: Stories of Race, Resilience, and Farming. Read more about the book and the author here, then check out the first, second, and third posts. The sky is a brilliant blue as I drive onto Cherokee land in the Great Smoky Mountains along the North Carolina–Tennessee border. I pull into a small driveway leading up to a modest house with a sign out front that reads “The Center for Cherokee Plants.” This is where Kevin Welch and Sarah McClellan work to save seeds and propagate plants significant to Cherokee culture. Kevin is a gentle, yet serious man, and I can feel his guarded demeanor as he explains that we will not be able to photograph some of the plants or gather detailed information on the seeds they save, as they are sacred to the Cherokee and need to be preserved and protected. We sit together in a circle under the shade of the carport where piles of farming equipment are stored, and Kevin begins speaking so softly that Sarah and I have to pull our chairs in closer to hear him clearly. The only other sound is the beautiful birdsong from the nearby trees. Kevin Welch: One of the things a lot of people don’t realize is that the Cherokee are the original agriculturists of this region. We’ve been growing food here for 6,000 years. Agriculture developed for us as it does for many cultural groups: Once our resources were stable enough and we didn’t need to spend our time searching for those resources, we started cultivating. We started raising squash several thousand years ago and beans and corn in the last 1,400 years. But agriculture for us still includes wild gathering. We collect our food from plants, either what we cultivate or what we gather from the woods. I tell the kids we work with, we’re not horse people like the Plains Indians, we’re not salmon people or fish people like the Northwest tribes, we’re not desert people like the folks in the Southwest. We came out of the woodland. We’re agriculturists. We believe in the power of the plants that grow all around us. It’s part of Cherokee folklore that plants are sacred and not only feed us but have healing powers. An old Cherokee story is that when animals were being over-hunted by men, the animals decided to get together and hold a counsel, and they decided to infect man with disease, and each animal came up with a disease. But the plants were still friendly toward men, so each plant came up with the cure for each disease that infected man. This story teaches us that if you look around, the cure for what ails you is always growing close by. Cherokee people have a holistic approach, and many Native peoples all over the world have always believed that the things we need to maintain our lives are out there, surrounding us. But our people have gotten away from who we are. The younger generation has lost their heritage and forgotten how to garden as our elders did. Our diets and health as a community have changed drastically. Native Americans have the highest rates of diabetes, heart disease, and psychological illness, like depression and alcoholism. * Up until the last few decades, we never ate all the processed foods introduced to us from outside of our culture. We’re only 600 years removed from never even seeing you guys before. This has had a huge impact on us. If we can bring back our cultural foods and put them into the hands of the person that’s putting food on their tables, then we can change things. That’s what we do here at the Center, we collect and propagate culturally relevant plants that Cherokees have historically used and give them to Cherokee families while re-teaching them the skills to grow their own. We find and save heirloom seed varieties or develop them if we can no longer find them. We’re a seed bank, but our goal is not to keep seeds here; our job is to get them out there to the enrolled Cherokee members. The best way to save an heirloom seed is to share it. The Cherokee tribal leaders recognized the need to put agriculture back in the community, so the chief started a garden kit giveaway program which Kevin and Sarah provide seeds and seedlings for. They give away 700 garden kits every year, with the seeds and seedlings ready to put in the ground. They’ve been doing this for about nine years and have given away over 6,000 garden kits to enrolled Cherokee members. Kevin and Sarah also have a youth gardening program and a mobile classroom which they use around the state to give workshops on gardening, health and the cultural history of Cherokee plants and foods. Sarah McClellan: From my perspective, the really effective teaching that Kevin does is with Cherokee people. There’s a whole different dynamic when Kevin is teaching, no matter what the age, because he is part of the community and of the culture, and that really makes a difference. Education happens so differently then, as opposed to when agricultural workshops are taught from people like me from outside of the community. Having a Cherokee teaching Cherokee people creates a connection that couldn’t happen with a written curriculum that comes from a national gardening program. A government or outside agency just truly can’t be that effective when doing this work because it’s not of the culture. KW: That culture is what we’re keeping alive here, aside from these plants. The plants that we collect and cultivate each have a story behind them, and that story is what makes them relevant to our culture. That concept applies to any group of people. Just like storytelling, song and art, agriculture is a part of culture. It enriches culture. When we talk about getting back to our roots, food really is the basis of that. To bring back the history of our plants and our people, we interview elders and do memory banking, collecting oral histories. It’s like being Sherlock Holmes, discovering so many unknown stories about every seed. You can take a handful of seeds, and it just looks like a handful of seeds, or you can take it and see that these seeds were grown by a family for survival at one point through the Depression, or they were hidden in the long skirts of Cherokee women during their walk from here to Oklahoma. Our heritage lives in these seeds, so when we give them to people we are empowering them not only to grow but to revive culture. And when we teach kids the skills to grow, we’re giving them ownership over their gardens and their heritage. They are being empowered too. They’ve learned a life skill that they can use and pass on to the next generation. To me, that’s the success story because our ways have been changing with each new generation. We’ve lost much of our agricultural land because of generational change, and we’ve also lost much of our wild gathering lands. The national park next to us doesn’t allow us to go into what were our traditional gathering areas to gather our wild foods. The mentality is conservation, but the misunderstanding is that Cherokee harvest with a philosophy of conservation. It’s a simple philosophy: If you destroy your resource, you have to move somewhere else to find another resource. If you want to have your home here and keep your resources, you don’t destroy them. Our people never took more than we needed. The White attitude was get it all before somebody else gets it. That’s not the Cherokee attitude. If we’re gathering from a plant for the green, we don’t take the whole plant. We’ll take some of the leaves off of it, and move on to the next one. We know the proper way to harvest without depleting growth. All of this really created a need for us to bring these kinds of plants back. With the loss of access to wild gathering and agricultural land, propagating these plants ourselves and putting them back into the community became our solution. Their solution has been a huge success. 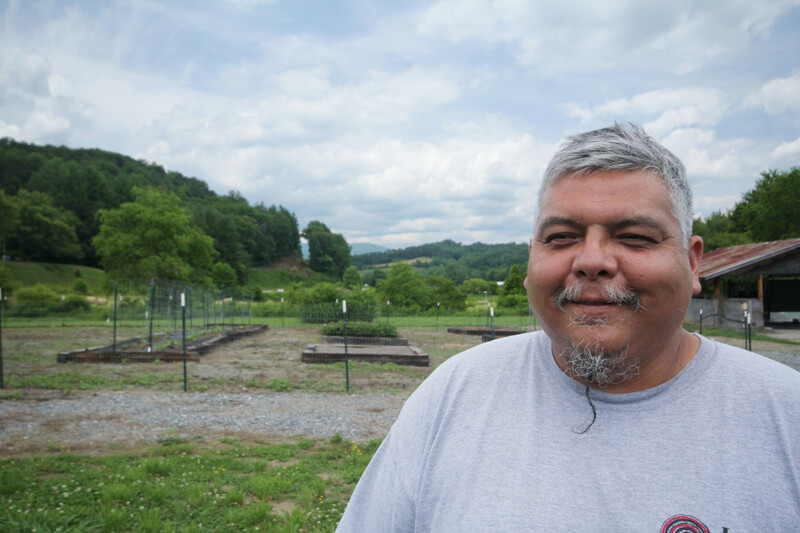 They’ve seen a 70 percent increase in the number of gardens within the Cherokee community, and they have garnered a lot of interest from within and outside the community, including other Native American tribes around the country. Kevin travels all over to speak and teach about their seed bank and propagation program. He has provided support to the Sac and Fox Nation (Sauk and Meskwaki Native Americans) as they started their gardening program, and he’s provided seeds to the Western Cherokee in Oklahoma who are starting a similar seed-banking project. KW: We really enjoy working with other tribes. We, as Native Americans, get exploited enough in life. We’re not trying to create traditions, we’re just trying to save the ones that we have. * About 60 percent of Eastern Cherokee children are overweight or obese. About 35 percent of Eastern Cherokee adults are diagnosed with diabetes, and almost 25 percent of their enrolled members live at or below the poverty level. Photo: Kevin Welch by Natasha Bowens. Good job Kevin Welch. You're doing important work.